Is Jason Starr and Andrea Mutti’s book just another return-from-death story or the next Revival? 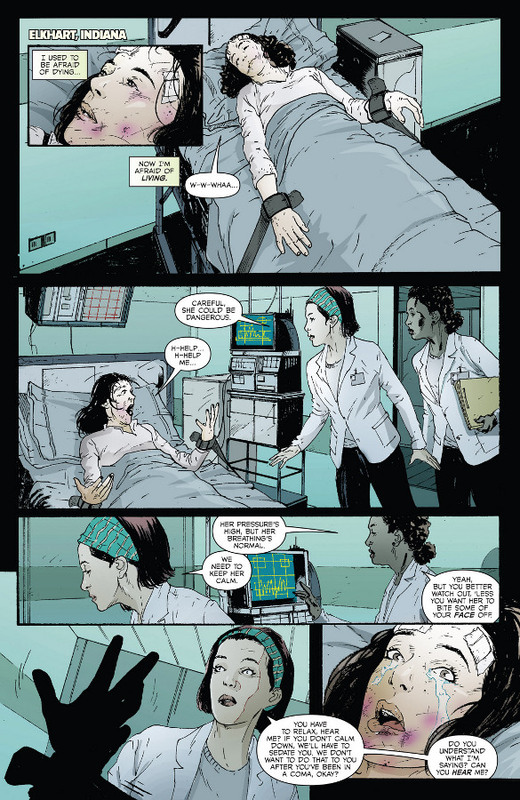 It’s unfair to compare The Returning to any of the other not-quite-zombie tales that have littered pop culture recently, such as Image’s Revival or either of the big TV shows, The Returned and Resurrection. At the same time, they’ve all popped up so near to each other that it’s nearly impossible not to. What The Returning (from BOOM! Studios, by Jason Starr and Andrea Mutti) does so well that separates it from the others in this sub-genre is that it forgoes the slow build. When we open to the first page of this book, the world already is aware of the returners. In this world, when someone dies and comes back to life, they come back changed. They are more violent, frequently killing people for no reason. It creates a tension in the world – a fear that going out for a gallon of a milk will result in a slashed throat. Everyone around you is potentially dangerous. While the other works in the sub-genre usually build gradually to a similar situation, it’s refreshing to be put directly into the dangerous world. It combines some of the usual trappings of zombie stories with something more along the lines of Invasion of the Body Snatchers. Anyone could be one of these “zombies”: there are no tell-tale signs of rotting flesh to clue you in. Who do you trust? Perfectly complementing that eerie vibe is the artwork of Andrea Mutti. The artist creates a gritty, realistic-looking world where danger lurks around every corner. Each individual character is fully realized, even the ones that are merely background or killed right away. It’s an impressive feat, and the style somewhat resembles what I imagine a Michael Lark-drawn horror comic would look like. The world and paranoid atmosphere of The Returning separate it from other stories of its ilk. Unfortunately, that’s where my praise stops. Starr wastes this well-made world on a very typical story of a girl going to prom, an overbearing father, and a too-handsy prom date. The normalcy of the events are meant to be seen in parallel with the heightened realities of this story, but it ultimately comes across as feeling rote. The book takes an interesting turn after our main hero is killed then resurrected, when the fear and paranoia are turned on her. But, again, I feel that the opportunity to explore this turning of the tables is wasted when her family is killed and she is forced to leave her home behind. What could have been an interesting character study becomes a typical man-on-the-run tale, where everyone is the enemy and no-one is to be trusted. There are also vague hints of this turning into a conspiracy tale, and that’s just so far from where the book started that it feels ridiculous. The tone and atmosphere of The Returning are home runs, but they’re wasted on a story that sometimes feels too familiar and builds far too quickly. A University of Montana journalism grad, Levi writes about all thing pop culture and sports. He loves comic books and the history of the medium. Staff Picks for October 4, 2017 – Marney the Fox, Breaks, Eugenic, Geis and More!